It’s nearly impossible to create the beautiful, custom granite looks you’ve become accustomed to from Prestige without also creating a lot of granite scraps. Scrap granite, or remnants, refers to the small pieces left over after cutting the slabs that will eventually be used for your project. 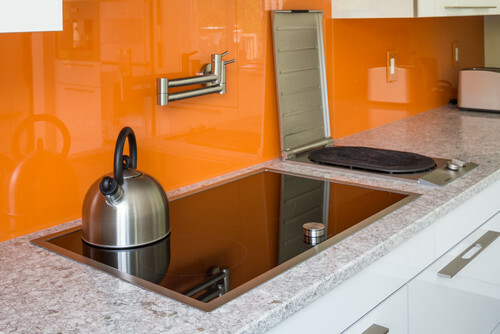 Industry experts estimate that about 30 percent of granite purchased is never used. Instead of filling landfills with this waste, why not try repurposing it for different projects throughout your home? Remnants can obviously be used on vanities and smaller jobs, but we’re thinking a little more outside the box. There are so many different home improvement projects where you can use granite scraps. The possibilities are really limited only by your imagination! Granite’s natural durability makes it a great choice for outdoor furniture. You can get really crafty with it and create an entirely new table if that’s your style. Here someone put a piece of round cut granite on top of an old wine barrel to make a beautiful high top table that would be perfect for a smaller space. Using granite remnants is an extremely cost effective way to create an impressive outdoor fountain. Your water feature doesn’t have to be large to make a big statement. A smaller fountain makes a beautiful addition to any size garden or green space. This could also easily be recreated to add a tranquil touch indoors. If you’re planning a kitchen makeover, you’re probably already well aware of the overwhelming number of appliances on the market, many with exciting bells and whistles, and available in a range of price points. One way to narrow down the seemingly limitless choices is to eliminate the energy hogs and look for the greener, more eco-friendly appliance options. Though some green choices may be more of an initial investment, the savings will quickly pay off in terms of energy savings–and you can feel good about reducing your home’s carbon footprint. 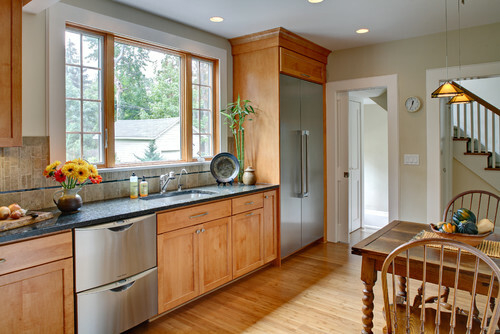 Make eco-smart choices with these tips for selecting energy efficient appliances for your kitchen. The refrigerator is the biggest energy hog of all the kitchen appliances, accounting for as much as 15 percent of your home’s energy usage. Choosing an energy-efficient refrigerator can be as easy as looking for the Energy Star* label; but for maximum efficiency, don’t stop there: side-by-side refrigerators use about 20 percent more energy than top or bottom freezer models, and through-the-door ice makers and water dispensers increase overall refrigerator energy consumption by 10 to 15 percent. *If all refrigerators sold in the United States were ENERGY STAR certified, the energy cost savings would grow to more than $1.4 billion each year and 19 billion pounds of annual greenhouse gas emissions would be prevented. While gas cooktops use less energy than electric ones, they do release combustion by-products (carbon monoxide, carbon dioxide, and nitrogen dioxide) into the air. 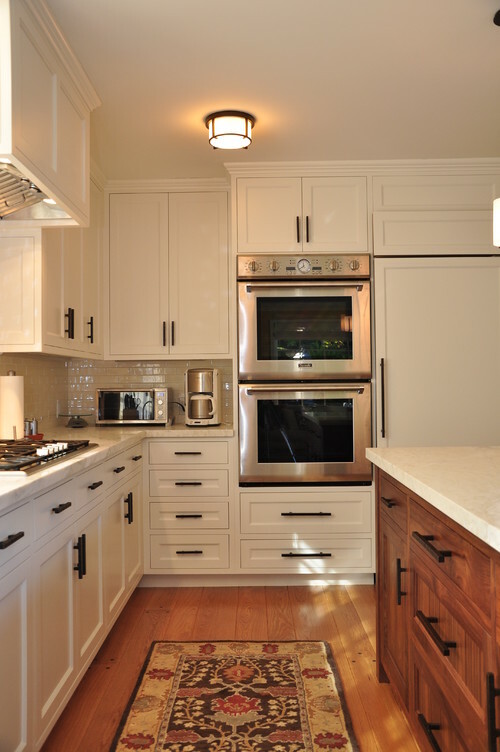 If you choose a gas cooktop or range, be sure to have a hood ventilated to the outside of the house. A good quality exhaust hood will remove up to 70 percent of these pollutants. 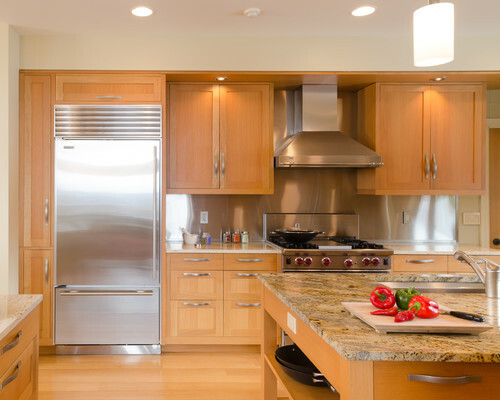 Look for Energy Star certified exhaust systems which use 65 percent less energy and avoid downdraft hoods, which do not perform as well as overhead hoods. Magnetic induction cooktops and ranges are much more energy efficient than gas or electric because they cook food faster and lose less heat in the process. A magnetic induction cooktop’s heat is transferred directly to the pan through high-tech magnetism, leading to little wasted heat. By only heating the pot, and not the air around the vessel, the result is a cooler kitchen for even more energy efficiency. Ovens are inherently inefficient. For better efficiency, choose the smallest oven for your needs. If you have occasions when a small oven just won’t cut it, consider two smaller wall ovens rather than one large one. Look for models with a convection option. Convection cooking employs a fan that circulates heated air around the food, reducing temperature and cooking times and using 20 percent less energy. Additionally, models with self-cleaning features are better insulated, which boosts efficiency. Energy Star–rated dishwashers use at least 41 percent less energy than the federal minimum standard. Look for models with energy-saving wash cycle options, as well as models with booster heaters that will rise the water to 140 degrees while keeping your water heater at 120 degrees. Dishwasher drawers are great energy savers for running small loads. Install two units for full size dish washing when needed. Prestige Marble & Granite is your midlle Tennessee source for beautiful, enduring and sustainable natural stone countertops to comlement your eco-friendly kitchen.We have something for every taste and every budget. Our knowledgeable staff is here to help you through selection, layout, design and installation. We welcome homeowners, designers, and contractors to browse our showroom any time! If you’re exploring the possibility of a bathroom renovation, you have most likely discovered that there is an enormous number of choices available to consumers, which can be overwhelming, to say the least. You are also probably well aware that most older bathrooms are scenes of over-indulgent water usage and excess energy consumption. So, why not kill two birds with one stone by selecting eco-friendly options for your new bathroom? Not only will you be doing a kindness to the planet (and most likely your wallet, too! ), you will narrow down the plethora of choices dramatically! Here are some eco-smart tips for transforming your eco-wasteland into a luxurious green haven – without sacrificing performance. Since toilets can use more than 25% of a home’s water consumption, selecting a low-flow toilet is a good place to start. Back when the law first mandated that newly manufactured toilets could only have 1.6 gallons of water per flush (older pre-1994 toilets flush up to seven gallons of water in a single flush! ), “low-flow” became a dirty word – but gone are the days when low-flow equaled low-performance. Low-flow toilets today provide ample flushing power while still using just a fraction of the water. In addition to the traditional (yet modified), gravity-assisted toilets, there are several newer low-flow options available. Pressure-assisted flush toilets use pressurized air in the tank to push the water into the bowl more forcefully, which helps to make up for the lower water amount. Some toilets have pumps for more flushing power, but be aware that the pump requires an electrical source. Dual-flush toilets are a newer design, with the option of pushing one button for flushing liquid waste (.8 gallons of water per flush) and another for solid waste (1.6 gallons per flush). When shopping for a toilet, look for the WaterSense label, which indicates the toilet is 20 percent more water efficient than average products in that category and it performs as well or better than their less efficient counterparts. Replacing old, inefficient faucets and aerators with WaterSense labeled models can save the average family 700 gallons of water per year. Faucets with the WaterSense label use a maximum of 1.5 gallons per minute (as compared to the standard flow of 2.2 gallons per minute) and can reduce a sink’s water flow by 30 percent or more without sacrificing performance. For even better water and dollar savings, go one step further and install a motion sensor, or touchless, faucet. Most of us probably use more water than we need when brushing our teeth and washing face or hands. A touchless faucet will keep this wasted water from adding up–just turning the water off while you’re brushing your teeth can save as much as 3,000 gallons of water per year! Like the low-flow toilets, low-flow shower heads have come a long way–and they are doubly efficient. Not only do they save the amount of water you use, they also conserve the energy you use to heat the water. Select a shower head with a flow rate of less than the mandated 2.5 gallons per minute for maximum water efficiency. You’ll find two basic types of low-flow shower heads on the market: aerating-flow and laminar-flow. Aerating shower heads mix air with water, forming a misty spray. Laminar-flow shower heads form individual streams of water, creating the sensation of more water. And as an added bonus, laminar heads also lose less heat because no air is mixed in. Laminar technology doesn’t produce as much steam as aerated methods, which is beneficial if you live in a humid environment. As with toilets and faucets, look for the WaterSense label when shopping for shower heads. Natural stone countertops, floors and wall cladding are the natural choice for your environmental decision-making during a bath remodel. Marble, granite and other natural stone surfacing will not need to be replaced for a long time, lasting for at least 100 years in many cases, and certainly for the life of the building in most. Research conducted by the University of Tennessee’s Center for Clean Products found that natural stone does not directly emit any VOCs (Volatile Organic Compounds). While it’s possible for stone to source VOCs from adhesives and applied sealants, low- and no-VOC options are available. If you haven’t already made the switch to LED light bulbs, now is the time. Though more expensive initially, LED bulbs consume 80 percent less energy than the old incandescent bulbs, and they last 50 times longer (20-25 times longer than a typical halogen, and 8-10 times longer than a typical CFL). CFL bulbs (also energy-saving alternatives), by comparison, only last up to 10 times as long, contain mercury and don’t work well with dimmers. LED light bulbs have made great strides over the past few years and now cover the range of light, from soft and warm to crisp and cool. Combine saving hundreds of dollars per bulb in energy savings with a lifespan of more than 11 years, and the choice of LED lighting for your bathroom is an easy one. When you’re ready to select your countertops for your new eco-friendly bathroom, Prestige Marble and Granite has the surfacing you need . We offer a large selection of exotic and rare natural stones that will give your design project a one-of-a-kind look as well as an eco-friendly character. Stop by our indoor showroom anytime; we’re here to help you every step of they way – from selection and layout through fabrication and installation.